Is It OK to Run After Lifting Weights? Cardiovascular and strength training exercises are essential elements of a well-balanced fitness program. If you are considering including a cardiovascular activity like running and a strength training exercise like lifting weights in your weekly workout routine, you may be wondering when it's best to do them. Before you create the plan that will help you the most, consider what you are trying to accomplish by establishing clear fitness goals. If your primary fitness goal is to increase your muscle mass and realize substantial strength strides, running after you lift weights is a logical approach to your workout . In this case, you will have more energy to perform maximal lifts before you start to feel any muscle fatigue. Running after your strength training session will support your goal of realizing strength gains by supplying the muscles you trained with more oxygen and nutrients to aid recovery. When you have running goals such as improving your speed, logging longer miles or conditioning for an upcoming race, it makes sense to run before you lift weights. When you lift weights first, your muscles will already be fatigued to some extent, which could make faster, longer runs more challenging. When you are training for a competitive event, like a race, it is important that you enhance your energy levels and familiarize your body with the most successful approach for your athletic event. You may have decided to incorporate running in your workout regimen to burn more calories. If burning calories is your primary goal, integrate weight lifting and running into the same workout. Interval train for 20 to 30 minutes. Run full speed for 60 seconds and then recover by lifting light weights for 60 seconds. Repeat this sequence 10 to 15 times. 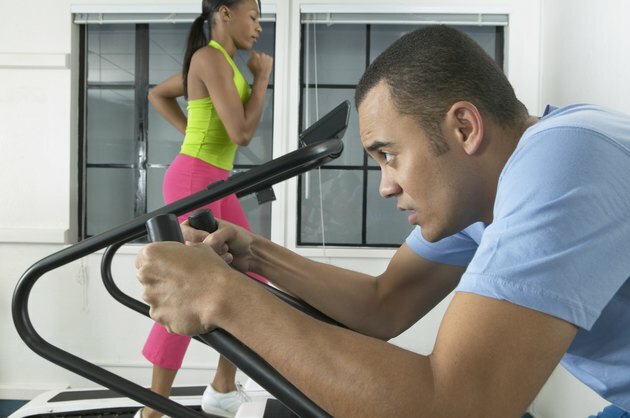 Interval workouts help you burn more calories in a shorter period of time. While establishing fitness goals can help you determine the most logical approach for working out, it is important that your approach includes an appropriate amount of both cardiovascular exercise and strength training. Aim to get in at least 150-minutes of running or some type of cardiovascular exercise each week and weight train no more than two to three days. If you work out most days of the week, designating specific days for running and lifting weights can be an effective way to get the most out of each type of training session while meeting weekly workout recommendations.